Lemon, Lime, Orange…pretty much any citrus flavor just screams Summertime to me! Especially if it’s cool n’ creamy! With all the hot weather we have been having, I am trying not to heat up our kitchen. 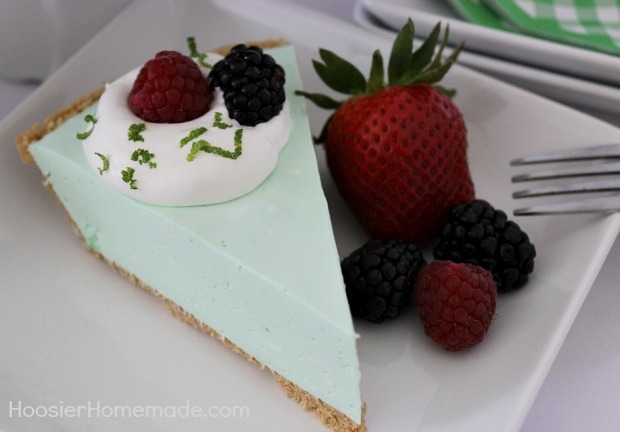 Our family loves the no bake Strawberry Pie so I knew this Lime Pie would be a hit too! Perfect for potlucks – easy enough for weeknight dinner at home – and elegant enough to serve at a dinner party, this Lime Pie starts with Jell-O and has extra flavor with freshly squeezed lime juice and the zest of the lime. Many moon ago, I collected the little cookbooks, you know the kind, Betty Crocker, Pillsbury, even Pampered Chef makes them. 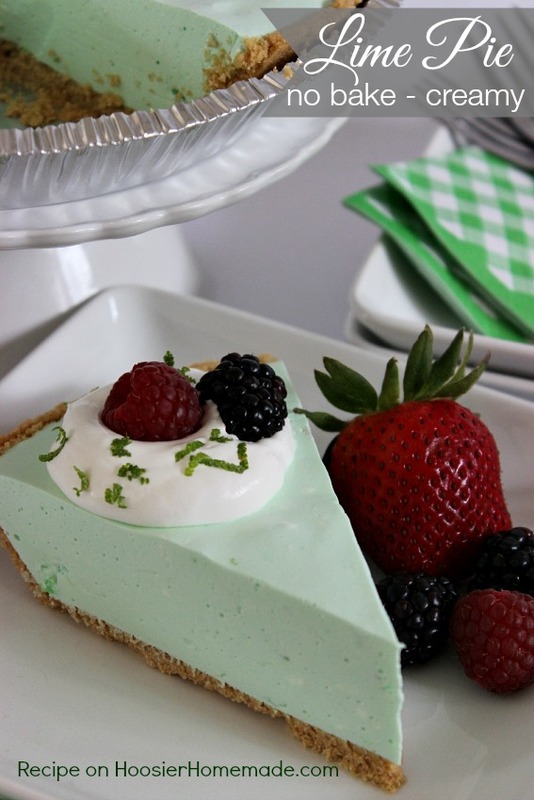 I have one that was published by Kraft in 1993, Simple Desserts Made Special with Cool Whip (Favorite All Time Recipes) , which is where I found this recipe for Summer Lime Pie! Using a store bought graham cracker crust makes this recipe really easy, you can of course make your own, they are pretty easy. Serve with a dollop of Cool Whip, a sprinkle of lime zest and fresh berries for an elegant yet easy dessert. Add Jello to boiling water and dissolve completely, stirring about 2 minutes. Stir in lime peel and lime juice. Add enough ice cubes to the cold water to measure 1 1/4 cups, add to Jello, stirring until all the ice has melted. Stir in whipped topping with a wire whisk until smooth. Refrigerate 10 - 15 minutes or until mixture is very thick and mounds. Spoon into crust. Return to fridge and chill about 2 hrs until set. Garnish with more whipped topping, lime zest and/or fresh fruit if desired. 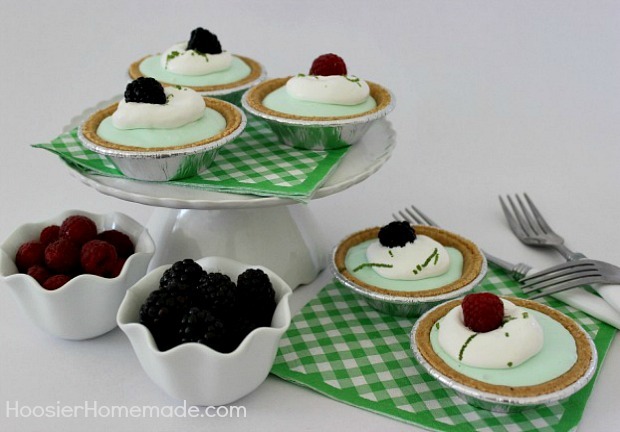 You can also find mini graham cracker crust in the baking aisle and serve this Summer Lime Pie in individual servings. What’s your favorite Summertime flavor? I just saved this same recipe (or very similar) when going through Weight Watcher dessert recipes! It sounds so light and refreshing! That’s a great idea Kim, you could use sugar free jello and fat free cool whip to lower calories as well. This sounds really good, but my husband isn’t crazy about cool whip. Would it be possible to use whipping cream and whip it after it was cool? Or would that end up with little chunks of jello in it? Hi Diane, you can certainly replace the Cool Whip with real whipping cream. I have not tried that, so I don’t know what the consistency will be, but it’s worth a try. Used a 1/2 pint (8oz) of Organic heavy whipping cream with 2 tsp of organic sugar in place of the cool whip. Whipped it with the mixer until it was real firm. Folded into the jello mixture. Let it sit in fridge until it was set. Spooned into the crust and I put in the freezer for 2 hours and then I placed it in the fridge. If it does not set right then keep it in the freezer. So yummy with the heavy cream. I am going to have to go hunt… I think I have that same cookbook! This sounds SO good on this crazy hot Indiana day. I’m thinking this may need to be added to our weekend menu! Thanks for sharing!!! @Kim… and Her Coffee, I love those little cookbooks! They are just chock full of good recipes! Yummo. I LOVE lime. So light and perfect for summer. Thanks for sharing and linkin up with tasty tuesdays. Hope you’ll come back again. I love these light, fresh pies. wow this looks really cool. 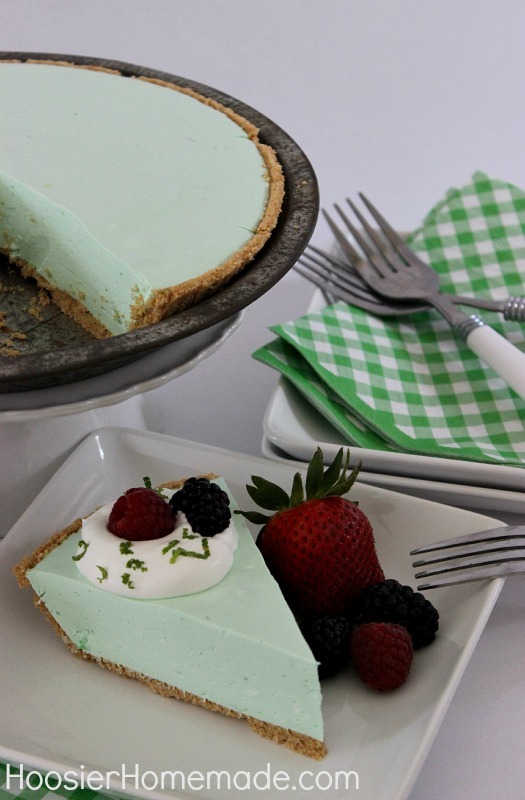 I posted a lime pie recipe today, too! 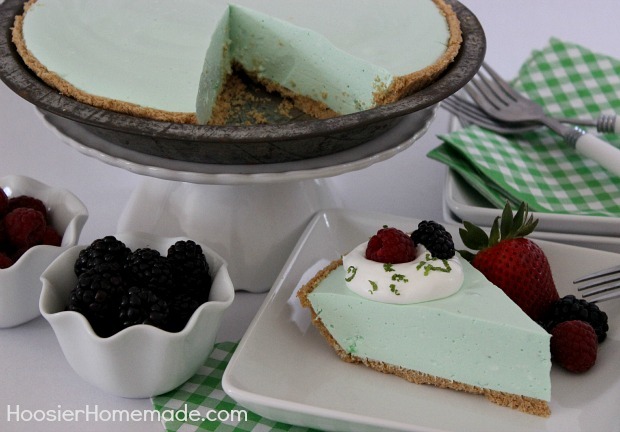 My mom used to make a pie similar to this one, but instead of lime jello, she’d use strawberry jello, and it made a really yummy summer pie. I will have to try your version, too! @Jaz @ Odd Mom, I’ve made Strawberry before too, with chopped strawberries in the pie. It’s a favorite here. Your pie sounds yummy! Off to check it out! I have been consumed with making lime flavored treats this summer! LOVE this recipe, it sounds sooo good! @Margo, Oh yum! What a great recipe! Thanks for sharing! @Margo, I just found a similar recipe this morning and posted it on my blog today after making them a little different and eating them all by myself. I love easy recipes that taste good. This sounds like the perfect summer dessert and I admit, I love anything with Cool Whip, LOL!